A septic tank is constructed of concrete, fiberglass or polyurethene. Older tanks constructed of cinder block, brick or metal are no longer allowed and must be replaced if found. The disposal field is typically a 3-foot deep trench filled with 12 inches of gravel on which is laid a 4-inch PVC perforated pipe covered with a geomat and 18 inches of dirt and grass. The household wastewater gravity feeds from the house to the septic tank where it deposits its solid load. Gravity then takes the water to the disposal field where it enters the pipes and percolates down into the gravel and upwards toward the surface. The microbes in the soil clean the bacteria from the water. The water is dissipated by percolation, evaporation and transporation. The septic tank(s) are constructed of concrete, fiberglass or polyurethene. The disposal field is usually constructed of a 3 foot trench filled with 12 inches of gravel on which is laid a 1-2 inch perforated PVC pipe covered with geomat and 18 inches of soil and grass. The wastewater gravity feeds from the house to the trash tank where it deposits its solid load. It then flows to the pump tank. The effluent pump in the pump tank pumps the water to the disposal field where it flows into the pipes and percolates down into the gravel and upwards toward the surface. The microbes in the soil clean the bacteria from the water. The field dissipates the water through percolation, evaporation, and transporation. The high water alarm warns of overfull tanks which is usually an indication that the pump has failed or the disposal field is clogged. 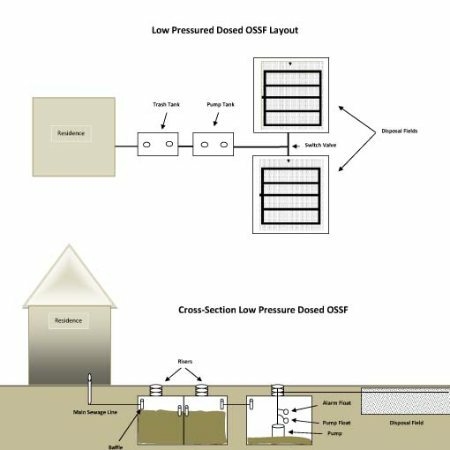 Unlike conventional or LPD systems which use the soil as the final treatment of septic effluent this technology is used in areas with poor soil conditions, and is designed to treat the effluent within the tanks prior to discharging it into the environment. 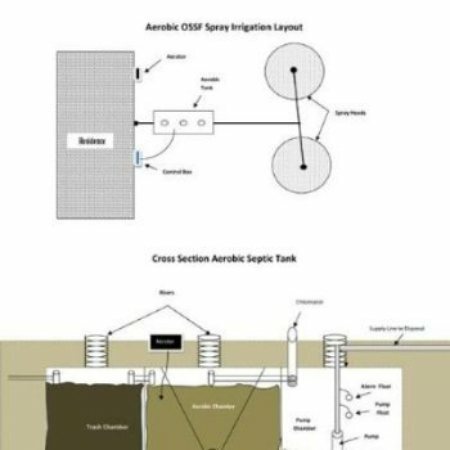 The system typically consists of an 3 chamber concrete aerobic pretreatment tank and a disposal field made of above ground spray heads or underground drip irrigation tubing. Associated equipment, depending upon the type of aerobic system, is a control box, aerator, effluent pump, floats, high water and aerator alarms, filters, chlorinator, and backwash equipment. The wastewater gravity feeds from the house to the trash chamber where it deposits its solid load. The bacteria laden water then flows into the aerobic chamber where air is injected into the "aerobic chamber" to stimulate the naturally occurring aerobic bacteria and thereby achieve treatment of the sewage. The effluent then flows through a chlorinator and on to the pump chamber which the effluent pump discharges it into the environment through above ground spray heads or underground drip tubing. It is imperative that the homeowner understand how this type of treatment system works, how to maintain it properly, and the costs associated with. Failure to maintain this system to the highest standards can lead to system failure and create a health hazard for humans and pets.